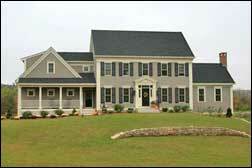 The MNBnews publication displayed one of the Company's new old homes that it built in Grafton, MA. Taken from its experience as a custom home builder, the new old home is the Company's signature design concept and product. A new old home is new construction that incorporates the latest building materials and techniques but it's architecture is classical / traditional New England. A new old home looks like the stately homes that lined the Main Streets of old New England villages in the 17th or 18th centuries. The design concept creates a new home that looks old but it has all the amenities desired today such as energy efficiency and open floor plans. Being a custom home builder in Grafton, the Company has also completed many home remodeling projects in Grafton and its broader service area. It applies the same design and building knowledge used in its new home projects to its home remodeling projects. Many of these projects incorporate the Company's new-old home and traditional New England architecture design concepts. The Company thanked the Millbury National Bank for its recognition. The Millbury National Bank is a truly strong relationship and community oriented bank.